Welcome to the Ship, where we offer a warm welcome and a great selection of pub food! The Ship pub in Croydon has long been known as the only real alternative pub in the area. Nowadays it's a retreat from the usual trendy, fluorescent lit, sticky-floored, chav-infested bars that you'd normally find in Croydon, The Ship is what you'd call an "alternative" pub, but the nights range from swing through to 80s to punk to classic rock to good, honest heavy metal. Not to mention the regular live music nights and Battle of the Bands competitions. Aside from the music, The Ship offers real ales like Spitfire, Marston's Pedigree, and Hobgoblin ale. Serving great pub food including delicious roast dinners on Sundays it really is a great place to come anytime of the day. 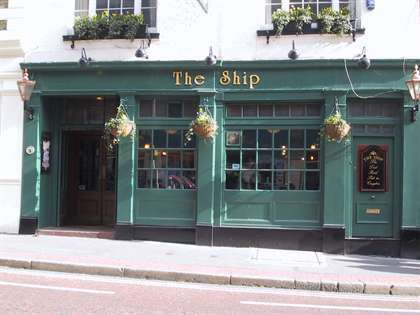 The Ship has the look and feel of an old traditional public house, with wooden floors, walls and always has a warm and friendly atmosphere where everyone is welcome. We’ll keep you updated with great offers, and news of what’s happening here at the Ship.